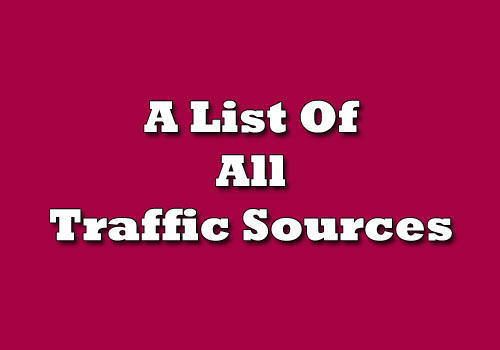 This post has a huge list of traffic sources for your web site. Both free traffic sources and paid traffic sources. All you have to do is start working on this list and setup a flow to get visitors to your site from each of these sources. You will be getting really quality traffic depending on niche and method of earning money. Nothing much to explain about these so I will just straight into the list. If you have anything interesting to add or find some sources no longer active please leave a comment and mention it. You will find paid traffic sources at bottom since not many will want to use those but everyone want to use the free traffic. 01. Search Engines : We can start with most popular but remember there are some not so popular search engines which used by thousands of people around the world. 02. Social Networks : Now this has become one of the biggest traffic sources. Sometimes you can get more traffic from these sites than you get from Google search. 03. Question Sites : These sites can provide you highly targeted traffic for any type of web site. 04. Forum Marketing : Web forums can be another great source of free traffic for your web site. Just do a Google search and make a list of all forums out there about your niche. Create accounts in all these forums and find away to drop links smartly. Best way be becoming a good member post regularly. Wait for month or 2 before adding links. 05. Blog Commenting : This is another way to get quality traffic. Make list of popular blogs in your niche and start commenting regularly. Make sensible long comments and Anyone who will find your comment interesting will visit your site too. 06. Good Article Directories : Not every article directory is great but there are some good sites which will send you some traffic. Make sure to select Article directories which are either popular or ranks in Google search. Make sure to submit unique and quality articles. 07. Social Bookmarking sites : Mass social booking is something in history but still there are several major social bookmarking sites which can give you huge amount of traffic. 08. Free Blogs and Web 2.0 sites : These free blog platforms can be great source of traffic and also provides you quality back-links if you maintain those properly. Complete list of free web 2 sites is >> Here <<. 09. Free Photo sharing sites : Sites like Flickr can give you quality free traffic if you know how to get it done. Also a good way to get quality back-links. Add your site name as a watermark so your will get visitors even if they are not allowing you to add links. 10. Video Share Sites : You can’t forget video sites because millions of people visit these everyday to find information and video tutorials. It might need some work but it can become a great long term traffic source for your site. 11. Mailing List : Not a easy method but this is one great way to get long term traffic. There many sites out there which offer free mailing lists such as Mailchimp.com (Free package has limited functions). All you have to do is gather email addresses from your site visitors to inform then promotions and other important things publish in your site. 12. Online Groups : There so many sites which offer members to create and maintain groups for things they interested. Just like forums and those answer sites this can be a really good way to get quality traffic. 13. Classified ad sites : There are hundreds of free classified sites out there which you can use for promoting your site. You have to be careful how to use these sites but if your into selling things or services traffic from these sites could be very helpful.